Nothing makes me more angry as a personal trainer than seeing lies being spread by unscrupulous people in an industry that is supposed to help people feel better. One of the most popular ones is that women should and can target fat in "trouble areas" with specific exercises. Other terms used around the same concept are "tone", "shrink", and "trim". This "5-minute fix" type of post is one of many that can be found on Pinterest. If pushups helped make arms skinnier, soldiers would have the tiniest arms out there! My Problem with "Problem Areas"
First, what do you mean by "problem"? Every body is different. Trainers should focus on listening to their clients to help them achieve their individual health and fitness goals. They should understand that well-being and fitness come in many shapes. 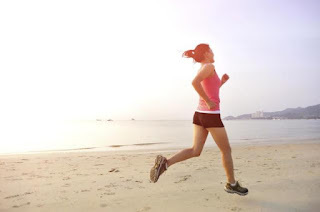 They should not encourage the false belief that if a woman does not look like in the magazines, it is because she is too lazy to do certain exercises. Finally, they should not be posting online about what women should work on making smaller or bigger! It is called personal training, not female-object shaping! Spot reduction means attempting to remove fat stored in specific areas of the body by doing exercises (often in high repetitions) that target the muscles under that area. It is an idea that seems to have started spreading in the 80s and was very popular in the 90s with all these "toning" exercise videos being marketed to women. I remember my teenage-self being tired of my thighs chafing when doing sports and of jeans that were so big at the waist, but so small at the thighs that no belt could help. Naive as I was, I decided to try out exercising with a Thighmaster machine. It did not work, of course, but I just blamed myself for it. It is likely what many people who did not get the expected results did and why the lie is still alive today. But after completing my training as a BCRPA-certified fitness instructor, I now know better. It had nothing to do with me: using a Thighmaster simply cannot make someone's inner-thighs smaller. Here is why. One of the first thing one learns as a personal trainer is that strength exercises help you build muscles. More muscles mean more mass, not less! That is actually exactly what happened to me when I used the thigh master as a teen: even more chafing issues. Yes, my legs were more "defined", because you could see the shape of my bigger adductor muscles, but they were definitely not smaller. The same applies to any other area targeted with exercises: it will not become smaller unless the overall body mass becomes smaller. Doing higher repetitions of an exercise helps you improve your muscular endurance for the muscles used and adds a little bit of a cardio component to the workout. You will burn more calories doing 50 bodyweight squats instead of 5 squats with a barbell, but the first exercise will not help you make your legs thinner while the other will make them bigger. Doing exercises in the 8-12 repetitions to exhaustion range leads to faster and bigger muscle mass gains than doing 15 or more repetitions. Still, high repetition exercises also lead to some muscle gains. It is especially visible for beginners. When someone's legs do get leaner after doing hundreds of squats and leg raises, it is not so much because they did "leg toning exercises", but because they burnt more calories than in the past and became leaner overall. They would have had similar results with any other (possibly more fun) calorie-burning activity, no matter what muscles they used. There are many studies out there that have proven that it is not possible to reduce fat in a specific body area by exercising it. My favourite study is one that looked at tennis players. If doing high repetitions of a movement would lead to the muscles used burning the fat around them, then tennis players would have one arm significantly leaner than the other. Measurements showed that it was not the case. Additionally, a basic understanding of human physiology (which I believe fitness instructors should have), can give some hints as to why it is not possible. Muscles cannot use the fat around them as fuel. I will not bore you with the details, but stored fat needs to go through the liver and be broken down into other molecules before going back into the blood and being used as fuel. This means that the body has no reasons to break down the fat stored the closest to the muscles being used over fat stored in other places. Last week, I saw a woman running on the balls of her feet without letting her heels touch the ground. Looking at her was making my calves and shins hurt. I wanted to share a few tips with her to help her improve her form, but she was wearing headphones and I was scared she would get upset. Her running form reminded me of how I used to run when I first changed my form to save my knees. Unfortunately, I know from experience that it is likely that she will get injured running like that. Coming home, I decided to write this blog post to hopefully save others from doing the same mistakes that I did. If you stand with your chin up and your chest out, you might appear over-confident, but if you hold your head down and hunch your shoulders, you might look self-conscious and broken down. 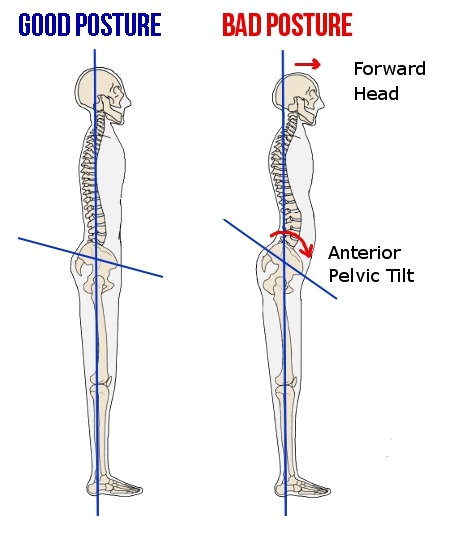 A good posture is somewhere in between both straight and relaxed. Good posture is about efficiency: all the joints of your body, from the ankle to the spine in the neck, should be aligned in a way that would allow you to stand and move with the less effort possible. Good posture is what allows ballerina to do complex movements in a way that appears nearly effortless. 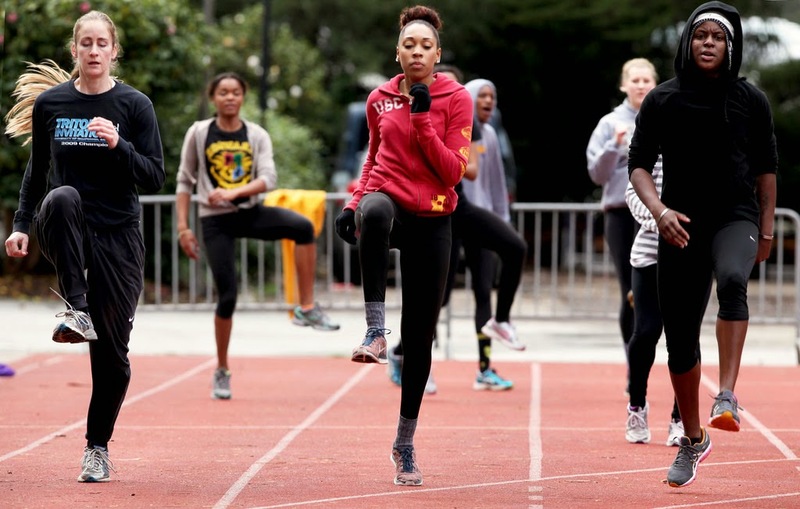 Good posture is required for sprinters to run as fast as humanly possible. It can allow you to stand or sit for hours at work without getting a sore neck or back, or to run further and faster with less effort. Below, I listed all the elements of a good posture taking a bottom-up approach. 1. Alignment Do your hips, head, shoulders and ankles line up? If there is one thing we amateur runners can learn from olympic athletes, it is how to warm up properly. They do not always show it on TV, but no athlete ever starts a race straight from sitting around or after just some light jogging. Before they enter the stadium, the athletes get to jog, do drills and practice strides on a separate warm up track. For sprinters like Usain Bolt the warm up can be more than a 100 times longer than the competition itself! They know that a good warm-up can make a significant difference in terms of both injury prevention and running efficiency.